The Russian football Union (RFU) wants to play a match of the qualifying round of European championship qualifier between Russia and Moldova at the stadium «Open arena». About this journalist said the CEO of the RFU Alexander Alaev. The meeting is scheduled for October 12. At this time in the form of the stadium, which will host the meeting, declared St. Petersburg «Petrovsky». «According to the rules of the UEFA stadium need to make a statement for the 3 months prior to the date of the tournament, said Alaev.- because of this, We decided to make a statement to provide the game With Moldova Petrovsky stadium in St. Petersburg. 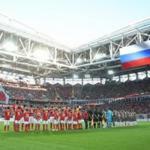 Then it was not literally clear whether Spartak stadium commissioned, will he all documents that are necessary to provide opportunities for international matches. But if for the match against Liechtenstein (the game was at the Arena Khimki «8 September and ended with the victory of the Russian Federation with account.- Approx.) We physically do not have time to make the stadium» Spartak «was certified UEFA, At the present time there is such possibility. In addition, Then the football Federation of Liechtenstein essentially refused to transfer the game to another stadium. To match With Moldova took place at the Opening of the Arena are all interested this is one of the best stadiums in the country. However, let me stress that We have always been pleased with how organized matches in St. Petersburg». «In the ongoing dialogue on the issue of the tournament Russia — Moldova at Spartak stadium,» said the CEO of the RFU.- With the Moldovan side, this issue has already been agreed. UEFA supports the initiative to move the game from St. Petersburg in the Russian capital, But requires that all the rules of certification of the stadium» Spartak «had been met. Leaders Spartak, we must pay tribute to them, walking towards us. We anticipate relying UEFA they will come in early next week. I hope that «Open arena «will receive the maximum score, and the match Russia — Moldova will take place on it».